 In July 2009, my brother Dieter made us aware of that fact that the International Space Station (ISS) was very bright at night. I found a schedule of observation dates on the Internet (www.heavens-above.com) and prepared my camera. The interesting question was: Would it be possible to recognize more than just a bright spot on the photos? 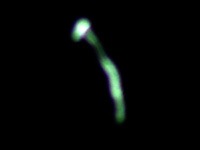 Earlier, I had seen photos of the ISS that were taken using a telescope and indeed showed a lot of details – but would this also be possible with a simple dslr? My second problem was to find the correct exposure. 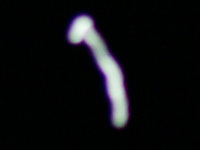 Using automatic expose, the bright ISS looked washed out, even when I compensated exposure (-3 EV). After some fiddling I switched to manual exposure, leaving the aperture wide open and playing with exposure time. Exposures around 1/100 sec to 1/250 sec led to usable results – and also prevented camera shake. ISO war set to a value of 3200. The following photos are direct crops from the originals (1:1), so this is the maximum size possible. And indeed, you can see more than just a bright spot! As the ISS looked still too bright, I also made it darker in Adobe Photoshop Elements. Finally, you get only useful results if you take photos when the ISS is closest and very bright. 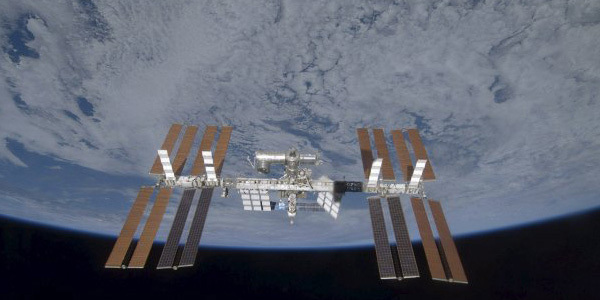 See also the Astronomy Links page for more ISS-related links. 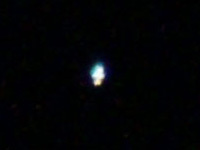 Third attempt (21.7.2009), perhaps the yellow dot is the docked space shuttle? Third attempt (21.7.2009), a little bit later, perhaps the yellow dot is the docked space shuttle? Third attempt (21.7.2009), a little bit later and brighter, perhaps the yellow dot is the docked space shuttle?